The RGA is running Hogan as if he was a Democrat. This is the kind of mailer that will make Democratic officials and activists howl at the moon, but it’s savvy as hell. 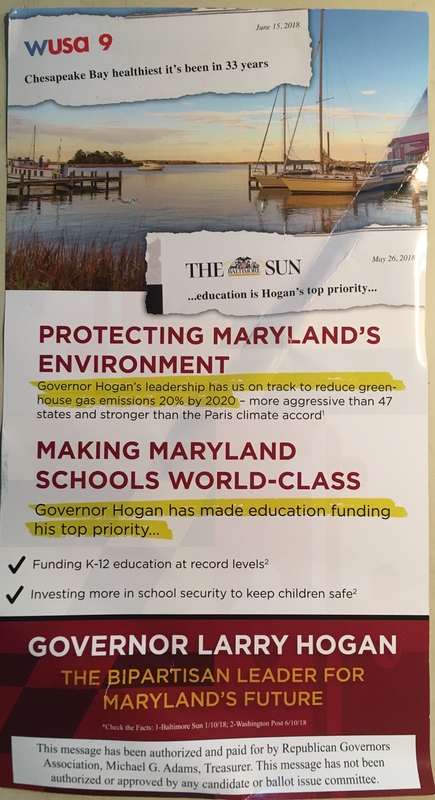 Let’s see: Hogan is pro-environment and pro-education but he won’t raise taxes. Simple, yeah, but effective. The Republican Governors Association (RGA) is promoting Governor Larry Hogan and attacking Democratic nominee Ben Jealous in a new mailer. 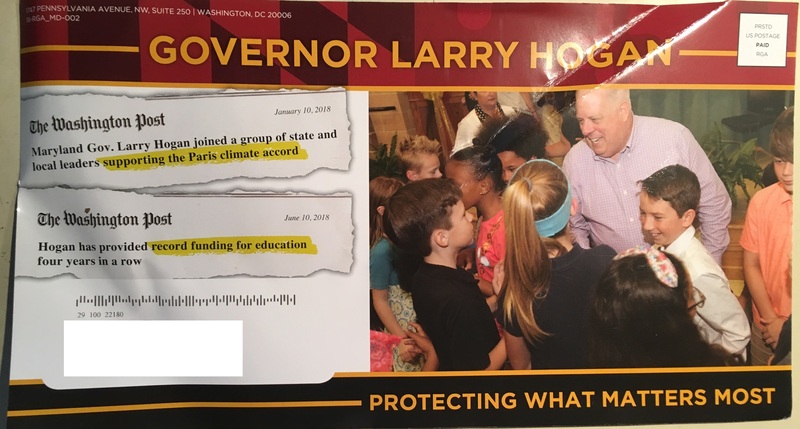 The mailer praises Hogan on education spending but neglects to mention that he cut K-12 state aid in his first budget and was forced by the General Assembly to fully fund it in years going forward. 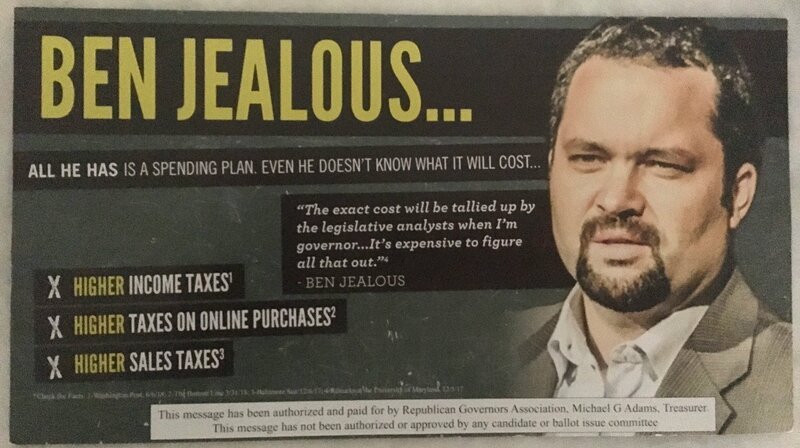 As for the mailer’s other side, it puts forth a message we are going to hear a lot about: the notion that a Ben Jealous administration will aggressively raise taxes. The mailer below was received by multiple Democrats in Montgomery County. This is Governor Larry Hogan’s first TV ad of the cycle. The Baltimore Sun fact checked it and found that it “inflates tax relief claims” among other issues. Gov. Larry Hogan (R) and Maryland’s Democratic legislative leaders have reached agreement on a one-year plan to stabilize skyrocketing individual health insurance premiums by taxing insurance companies and using the money to pay the biggest claims. Legislation that won initial approval in the state Senate on Friday would levy a surcharge of about $380 million on insurance companies that do business in Maryland, which are paying about that much less in federal taxes this year because of a one-time exemption provided by the recent overhaul of the U.S. tax code. Using that money for a “reinsurance fund” will lower premiums for everyone in the individual insurance market, officials and advocates said, heading off a potential crisis stemming from anticipated increases in premiums of between 30 and 50 percent and the possible departure of CareFirst, Maryland’s only statewide insurer for the estimated 154,000 individuals who buy their own plans rather than get coverage through an employer or government program. In this way, the Governor is working directly against efforts by Trump and congressional Republicans to kill off the Affordable Care Act through executive actions and ending the individual mandate. In short, Hogan is working with Democrats to achieve their goal of protecting health care for all Marylanders. Of course, it’s only a stopgap solution. If reelected, Hogan will have to extend the tax increase in one form or another in order to continue the reinsurance fund, or reestablish the individual mandate within the State of Maryland. No one can seriously believe that this is a one-time move. It’s completely the right thing to do but destroys the narrative that Hogan has reduced taxes. As the most powerful governor in the nation, Hogan could have stopped the tax increase. However, the Republican base has little choice to stick with Hogan but cannot be pleased or motivated by this decision. Can we please stop pretending that Larry Hogan is some sort of goo-goo Republican reformer? Do you think foreign nationals should be openly invited into our polling places on election day? Democratic Senators Kagan and Rosapepe think so. Now, they have introduced SB 190 that would give an international election observers the same rights as a U.S. citizen to watch over our elections for any polling place in the state that they see fit. SIGN AND SHARE the petition if you believe the Maryland Senate should vote AGAINST SB 190! I don’t know who came up with this unhinged horror at a piece of legislation that should be so uncontroversial as to verge on banal. Foreign election observers are common in elections around the world. The U.S. sends observers to countries around the world as part of observation missions. Indeed, the American government plays a major role in funding these initiatives through the International Foundation for Electoral Systems (IFES), the International Republican Institute (IRI), National Democratic Institute (NDI), Organization of American States (OAS), and Organization for Security and Cooperation in Europe (OSCE). All but the last are based in Washington. Beyond the creepy weirdness of attempting to whip voters up over people observing – a word that specifically excludes any participatory role – our elections, this is right out of the Trump playbook because of (1) its xenophobic attack on foreigners as somehow inherently nefarious, and (2) being resistant to any effort to improve the electoral process whatsoever. Trump is impervious to protecting our elections from proven Russian interference in our elections because it helps Republicans. (Ronald Reagan must be rolling over in his grave.) Under Larry Hogan, the Maryland GOP shows similar hostility to the most mild effort to improve our democracy in their effort to whip up hate about a bunch of foreign election experts who will come here, observe elections, and write a tempered report with a few suggestions for improvement. The Governor has just lost what little credibility as a reformer he had. He is willing to speak out against redistricting in Maryland, because he thinks it will benefit his party, but totally silent on Republican efforts to protect it north of the Mason-Dixon and south of the Potomac. Yet he found time to travel to Virginia to support the odious Ed Gillespie in his effort to become governor using hateful rhetoric and scaremongering. Despite Gillespie’s flop, Hogan apparently decided to import Gillespie-type tactics. 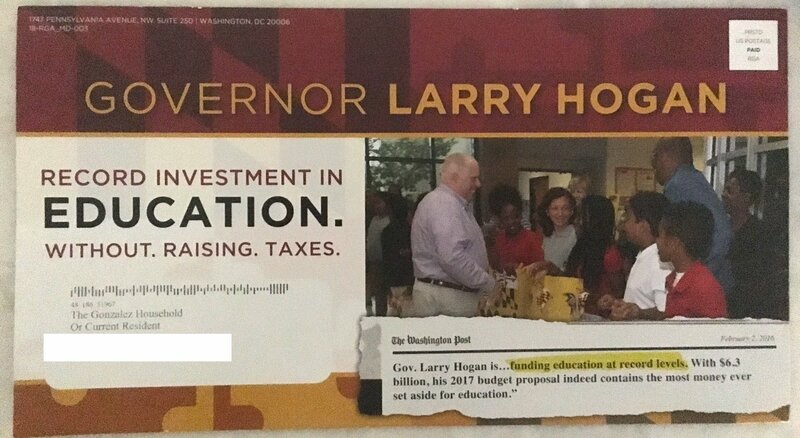 If Larry Hogan’s Republicans were remotely reasonable, they would never publish something like this. The Governor needs to repudiate it immediately and replace the people in the Maryland GOP who came up with this piece of tripe. Recently, we have run several reports on fundraising through January 2018. This post combines all of our data and presents the top 20 fundraisers in MoCo so far. 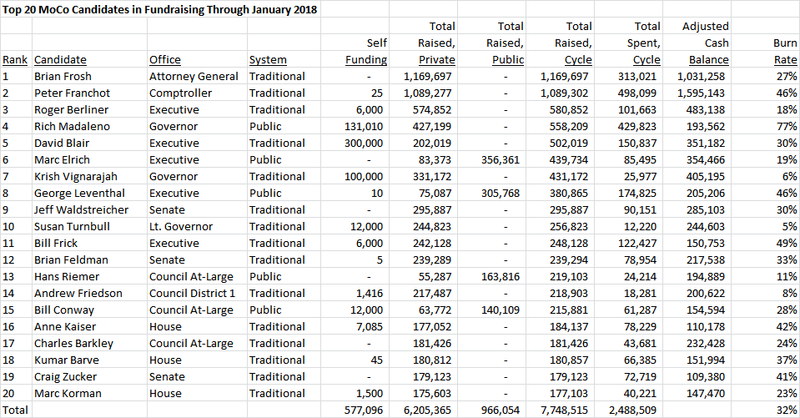 Note that we break out self-financing and report totals raised for the cycle, not just totals since the last report. And… here they are! 1. It’s natural to expect Brian Frosh and Peter Franchot to be the leaders since they both hold statewide offices. Of the county-level candidates, Council Member Roger Berliner, who is running for Executive, is number one. 2. The numbers for Senator Rich Madaleno (D-18), who is running for Governor, are misleading since he will be applying for public matching funds. Madaleno has said that he anticipates receiving about $975,000 from the state. 3. Delegate Jeff Waldstreicher (D-18), who is running for Senate, is the leading fundraiser among all of MoCo’s state legislators. He will need that money against his self-funding rival, Dana Beyer. 4. County Executive candidate David Blair, gubernatorial candidate Krish Vignarajah, Council District 1 candidate Andrew Friedson and Council At-Large candidate Bill Conway are first-time candidates. It’s a significant achievement for first-timers to make a list of this kind although it’s somewhat tempered by the self-financing of Blair and Vignarajah. 5. Delegate Marc Korman (D-16) is the only first-term elected official on this list. That’s a big deal and a sign of good things to come. 6. Council Member Marc Elrich, who is running for Executive, has never been on a top fundraising list in his life. He is now, and that’s thanks to public financing. 7. Lieutenant Governor candidate Susan Turnbull raised more money in a month and a half of campaigning than half the people on this list did in the entire cycle, a staggering feat. 8. Governor Larry Hogan has raised more money this cycle ($11.5 million) than everyone on this list combined. Note: an earlier version of this post mistakenly omitted Turnbull’s results. We have corrected it to include her. In 2014, candidate Larry Hogan ran on three issues: jobs, taxes and reforming Annapolis. From 2015 through the present, Governor Larry Hogan has based his agenda on three issues: jobs, taxes and reforming Annapolis. It’s a smart and focused way to campaign and govern and has largely (although perhaps temporarily) neutralized Hogan’s disadvantage as a Republican in blue Maryland. But now the state budget is suffering from a revenue shortfall. 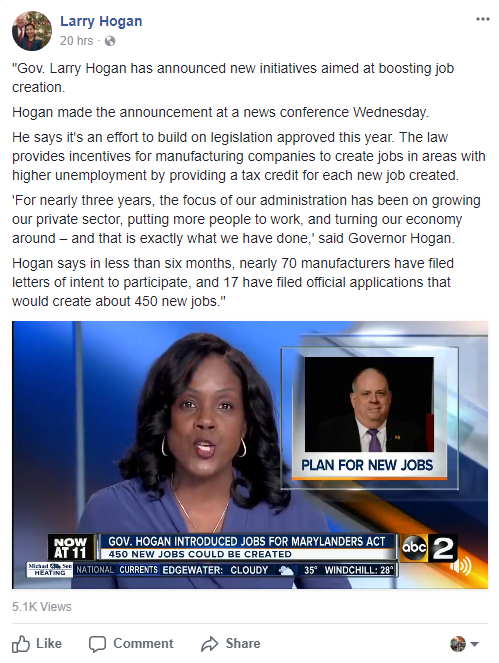 That calls into question Hogan’s standing on perhaps his biggest issue: jobs. Recent polls show that jobs and the economy are the second most important issue for Marylanders, trailing only public education. 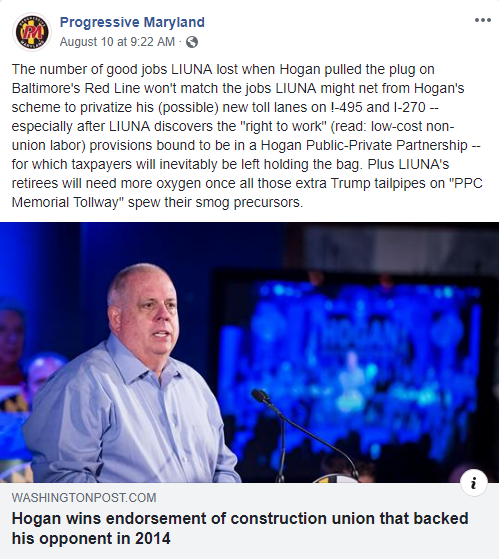 Accordingly, Hogan relentlessly promotes his jobs record in the press and social media, not so subtly using it as justification for his reelection. But if employment was really surging, state revenues should be booming. They’re not. One of countless Facebook posts by the Governor on jobs. Last week, the Board of Revenue Estimates, comprised of the Comptroller, the Treasurer and the Secretary of Budget and Management, voted to reduce the state’s revenue projection for FY18 (the current fiscal year) by $73 million. The reduction included shortfalls of $92 million in income taxes and $33 million in sales and use taxes, which were partially offset by increases of $18 million in estate taxes and $17 million in corporate income taxes. 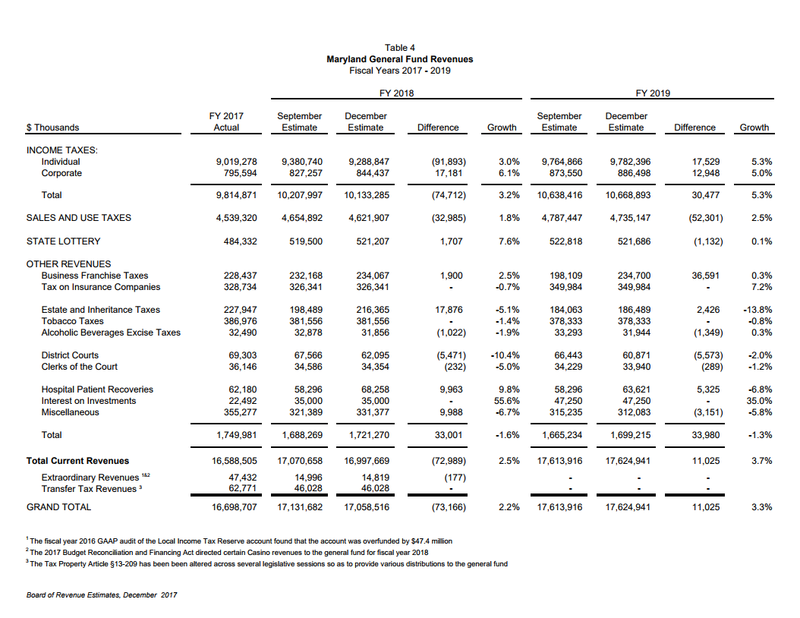 A summary of the shortfall released by the Board of Revenue Estimates. Given the fact that the November income tax distributions were down by 26% in Baltimore County, 29% in Montgomery County and 30% in Howard County, it’s not surprising that the state’s income tax projections would take a hit. In those three counties, tax planning by the wealthy to take advantage of next year’s federal tax cuts was probably a factor in their shortfalls. The fact that Maryland has the highest percentage of millionaire households of any state in the country leaves it vulnerable to these kinds of revenue swings. But that’s not all. The $33 million decline in projected sales and use taxes does not relate to tax planning by the rich. That’s a similar situation to what MoCo is experiencing as half the county’s shortfall comes from taxes other than income taxes. Hogan is dealing with the same problem as MoCo’s county elected officials: for all their claims that the economy is strong, healthy economies tend to not produce significant revenue shortfalls. Recent employment estimates are often revised substantially soon after their release, but current year revenue declines are something that governments have to deal with in the near term. The revenue projections that have been brought to this Board for approval were meticulously and carefully crafted based on what we know … and the trends we are seeing … and the data we are receiving. Once Congress approves a final version of the tax reform legislation, our experts here will work diligently to determine its impact on Marylanders’ income and our state’s fiscal future and propose revisions to our revenue estimates where appropriate. In other words, we’re doing the best we can with the information we have. But, here’s what we do know and here’s what the numbers tell us. While we have undoubtedly made considerable progress after the crippling effects of the 2008 Recession, with an unemployment rate hovering around 4 percent and stock market trends that are headed in the right direction, the fact of the matter is that thousands of Maryland working families and small business owners who were affected the most by the economic crash nearly a decade ago haven’t fully recovered. We continue to see that with declining sales and use tax revenue. With wages and salaries that are lackluster at best. Even those who are employed with good-paying jobs have – in more cases than not – elected to put their disposable incomes in their piggy banks instead of putting money back in our local economy. And who can blame them? With all the uncertainty that’s being produced by Washington at an almost daily basis, coupled with the continued fiscal and economic challenges that our state and our communities face, it’s understandable why so many of our citizens remain hesitant and timid about how they spend their hard-earned incomes. Let’s remember that Franchot has a famously cooperative relationship with Hogan. Even so, Franchot is saying that the state’s economy has not fully recovered from the Great Recession – which is exactly what we wrote about MoCo before the revenue crash. This is the opposite of Larry Hogan’s message that he has been great on jobs. His opponents are sure to take notice.